Standard Chartered bank is being fined $1.1bn (£843m) for violating US sanctions against Iran and over inadequate financial crime controls. The penalties, imposed in connection with a range of different investigations in the US and the UK, all date back to before 2014. The London-based banking firm set aside $900m in February in preparation for the settlements. 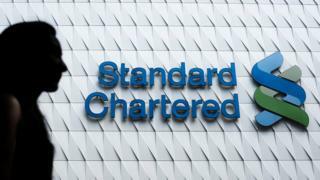 Standard Chartered has also undertaken to improve its compliance procedures. The bulk of the settlement, $639m, relates to breaches of US sanctions against Burma (Myanmar), Cuba, Iran, Sudan and Syria. The bank will also pay £102m to Britain's Financial Conduct Authority (FCA). The FCA found "serious and sustained shortcomings" in Standard Chartered's anti-money laundering controls. Bill Winters, the bank's chief executive, said: "The circumstances that led to today's resolutions are completely unacceptable and not representative of the Standard Chartered I am proud to lead today. "Fighting financial crime is central to what we do and who we are; we do not tolerate misconduct or lax controls and we will continue to root out any issues that threaten the trust we have built over more than 160 years." US authorities said a former banker at Standard Chartered's Dubai branch had pleaded guilty in New York to conspiracy to violate sanctions.